Set in a lovely rural location within orange groves there are 3 bar/restaurants with 3 mins walk and fresh bread is delivered daily to the door. Lively yet historic Gandia town is 10 mins drive away and has lots of bars, restaurants, cafes and designer shops. The beach of Gandia boasts 7 kms of beautiful golden sands "blue flag beach" and there are lots of smaller beaches locally too. For those who are more adventurous lively Benidorm is less than an hours drive away and beautiful Valencia is 1 hours drive or a short train journey. Valencia airport is 50 mins drive and Alicante 70 mins drive. A car is essential to enjoy this unspoilt area of Spain. 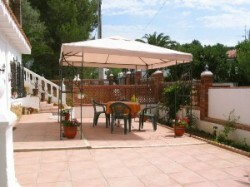 Special offer 5 July to 12 July 2008.The whole villa for �895.A saving of �200 for the week.